Ducher - white bush - the only white China rose. It blooms a soft ivory-white. Buds are round and often have a hint of pink on the outer petals. Typical bronzy new growth but the mature foliage of is uncharacteristically light green. Beautiful foliage, new leaves are red, soft white semi double blooms that continue through the summer. Fairly compact growth. This is definitely one of my favorite roses. Regarded as the only white China rose, ‘Ducher’ blooms a soft ivory-white. The buds are very round and sometimes have a hint of pink on the outer petals. Smaller than many Chinas, this is a good candidate for a container. Exhibits the typical bronzy new growth, the foliage of ‘Ducher’ is uncharacteristically light green. 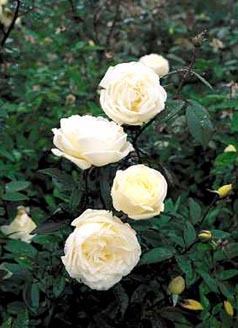 For those wanting a white rose that can stand the heat, this is the one to plant.